This outcrop lies immediately to the west of Robin Hood's Stride, so close it could be considered to be a part of it. It was Major Hayman Rooke who first described the tor in the 18th Century noting rock basins, stone circles and an augurial seat. 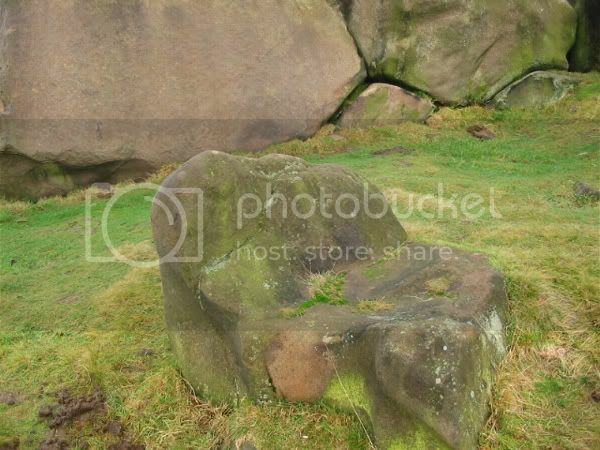 The seat, a rock shaped like a seat, he imagined was used by a high ranking Druid watching over the rituals performed here. From his descriptions of the stone circles as rings of continuous stones John Barnatt suggested that Rooke was recording cairn circles rather than true stone circles and suggested the area around, close-by, Dudwood Farm as to where they once stood. However, even though the circles are long gone, the rock basins and the seat remain at Durwood Tor to the west of the Stride as Rooke recorded; no such features are present near the farm. Above: Durwood Tor with Robin Hood's Stride to the left.